(Photo: Osservatore Romano)World Council of Churches general secretary, Rev. 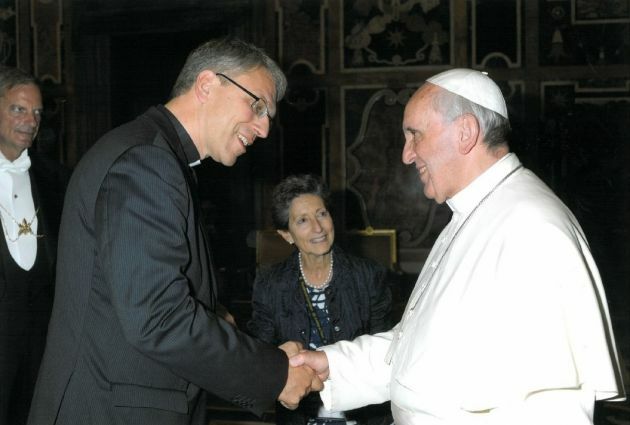 Olav Fykse Tveit, with Pope Francis in an audience at the Vatican on October 3, 2013. The leaders of the Catholic Church and the World Council of Churches represent a majority of the world's Christians so their meeting in Rome this week was important for global peace. They met during discussions on an important doctrinal letter on peace from a man who is now on the verge of becoming a saint. Pope John XXIII's Cold War era Encyclical Pacem in Terris or "Peace on Earth," remains "extremely contemporary. It can act as a guide to peace-building in today's world said Pope Francis at the meeting. Pope Francis met participants and spoke on October 3 at the three day Vatican conference celebrating the 50th anniversary of the John XXIII's 1963 Encyclical Letter. As well as the general secretary of the World Council of Churches, Rev. Olav Fyske Tveit, experts from the United Nations, Catholic universities and institutions, the Council of Europe, the African Union, and the Organization of American States were invited to Rome by the Pontifical Council for Justice and Peace to discuss the relevance of Pacem in Terris today. Francis noted the document was written in the most critical period of the Cold War, when humanity feared it was on the brink of a worldwide atomic conflict due to the lingering confrontation between the two superpowers, the United States and the Soviet Union. John XXIII, who will be elevated to sainthood in 2104, launched his dramatic appeal for peace to world leaders. "It was a cry to mankind, but also a plea to Heaven. "The dialogue that opened, with some difficulty, between the two great opposing blocs led them to overcome this phase during the pontificate of the other blessed pope, John Paul II, and to open up space for freedom and dialogue," said Francis. "The seeds of peace sown by blessed John XXIII bore fruit but, despite the fall of walls and barriers, the world continues to hunger for peace and the appeal made in 'Pacem in terris' retains a powerful current relevance." t the context of the encyclical in the 1960s when the world was on the brink of a nuclear war, peoples were overcoming colonial rule and joining the United Nations, and the civil rights movement was changing the United States. "Surely," he said,"the encyclical responds to the contemporary context and is, indeed, reading the signs of the times. "We can discern the consequences of Pacem in Terris today when His Holiness Pope Francis calls for a peaceful solution in Syria and condemns the proliferation of wars and conflicts. This was where Francis' words mesh with what the WCC sought at a September 18 meeting held on Syria in Geneva with church leaders from Syria, Russia, United States, Britain, France, Germany and Turkey. At that meeting they issued a call for an inter-faith peace meeting on Syria after talks with Kofi Annan, former United Nations general secretary, and Lakhdar Brahimi, UN-Arab League joint representative for Syria. "We discussed with one another and with Mr. Annan and Mr. Brahimi from the U.N., listening to their advice on what we could do to contribute to peace and reconciliation in Syria. "Our joint communiqué said, 'Churches worldwide have spoken out against the war in Syria [and] must continue to raise their voices in their congregations and with their governments. "We must strengthen the public outcry so that those in power will protect the common interest of humanity." In Rome, Tveit called on the churches to be congregations of peacemakers. He invited the Roman Catholic Church and the Pontifical Council to join in the "ecumenical pilgrimage for justice and peace," saying that "churches are included in God's work for peace."